Desmond Colvin takes down Todd Roberts on Thursday, July 30, 2015 during a mixed martial arts match on the deck of the USS LST 393, a WWII transport ship docked in Muskegon, Mich. Roberts was taken away by ambulance after too many blows to the head. Lamar Jordan of Muskegon Catholic Central reacts in the locker room after defeating Spring Lake in the last few seconds of the game at Muskegon Catholic Central High School Thursday, March 5, 2015. MCC won the Lakes 8 Conference title with a score of 50-49. Dakota Hudson (5) of Ravenna attempts to complete a catch on a fourth down while defended by Anthony Woodard of Muskegon Catholic Central in the first quarter of their game in Ravenna on Oct. 24, 2014. The play was not completed and turned over to MCC. Muskegon Catholic Central won 45-0. 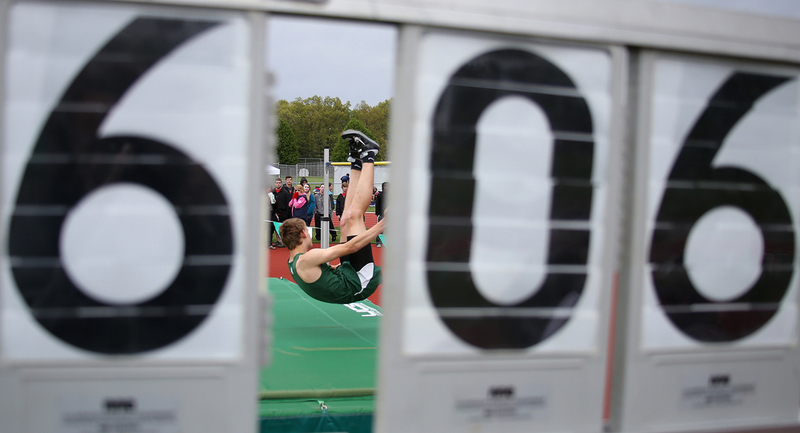 Nate McKeown of Hesperia lands the six foot six inch high jump to win first place during the Meijer West Michigan All-Star Invitational track and field meet at Reeths-Puffer High School Wednesday, May 20, 2015. Deyonta Davis of Muskegon goes up to catch a pass against defender Emmett Warners of Christian in the third quarter of their game at Muskegon High School Tuesday, Jan. 20, 2015. Muskegon won 65-54. Lukas Craggs (20) of Youngstown collides with Matej Paulovic of Muskegon before called for a penalty in the first period of the USHL playoff opener game at the L.C. Walker Arena Wednesday, April 15, 2015. Muskegon won 5-4 in overtime. 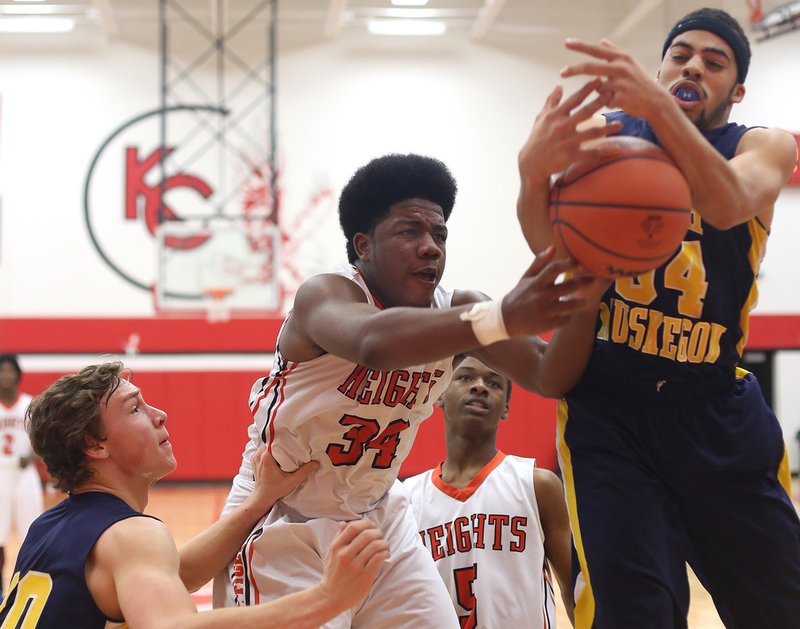 Keishon Watson (34) of Muskegon Heights Academy and Vernonell Smith of North Muskegon, right, fight for the rebound in the second quarter of their game at Kent City High School Friday, March 13, 2015. North Muskegon outscored the Tigers in a back-and-forth game to pull out the win and break the 12-year district drought. Peyton Ruel, 8, attempts to pump up Tony Curry of Oakridge as he ties his shoes in the locker room before their game against Spring Lake at Spring Lake High School Tuesday, Jan. 13, 2015. Spring Lake won 59-41. Deyonta Davis of Muskegon, center, hydrates himself surrounded by his team during halftime in the locker rooms at Mona Shores High School Friday, Jan. 16, 2015.